Here you can find out about all the interesting things that have been happening at Ladypool Primary School. Over the past few weeks we have been working with Nicky Maloney to learn to sign 'The Greatest Day' by Take That in British Sign Language. On Wednesday we came together as a whole school and did a sponsored sign to raise money for Sign Health, a charity which supports deaf and hearing impaired children both in the UK and abroad. This is the fourth time we have taken part in this event and this year we have raised over £140! We are delighted to share our Music Mark certificate for this year. We are in the Parliamentary review! On the 11th July we took part in an Arts Connect Festival alongside other primary schools. Each school took part in a number of workshops run by Hippodrome staff and developed a 10 minute piece of theatre based on one of Roald Dahl's stories. We chose Matilda as it was also being performed on the main stage. The day began with a tour of the theatre itself - we even go to sit in the Royal Box! The children then took part in a drama activity before having their dress rehearsal in the Patrick Centre. After a short break the 4 schools performed their pieces to each other before heading back to school, having had the opportunity to perform in one of our city's biggest theatres. It was a wonderful experience which will stay in the children's memories for many years to come. "Thank you so much for allowing us to deliver the speak out stay safe programme in school. The children were exceptionally well behaved. They were so polite and had lovely manners, please thank them for me." Congratulations to our Year 4 team who took part in a 'Maths Challenge' at King Edwards Boys School, Edgbaston on Friday. Sixteen Schools took part and our four mathematicians came second! Well done on a great achievement and for representing your school so well. June has been a month of sharing talent with our annual 'Ladypool's Got Talent' competition taking place. After class heats and some closely fought semi finals, where we saw a diverse range of talents from art to Lego making and football skills on display; we had our 10 finalists perform on a very hot afternoon to the whole school. We had a mix of talents from both KS1 and 2 and even a wild card entrant from Nursery who had wowed the semi final judges and audience alike when he did an impromptu dance routine to one of the other contestants music! After an afternoon which showed just how much talent we have, our 5 judges chose a group of acrobats from Year 4 to be our over all winners. 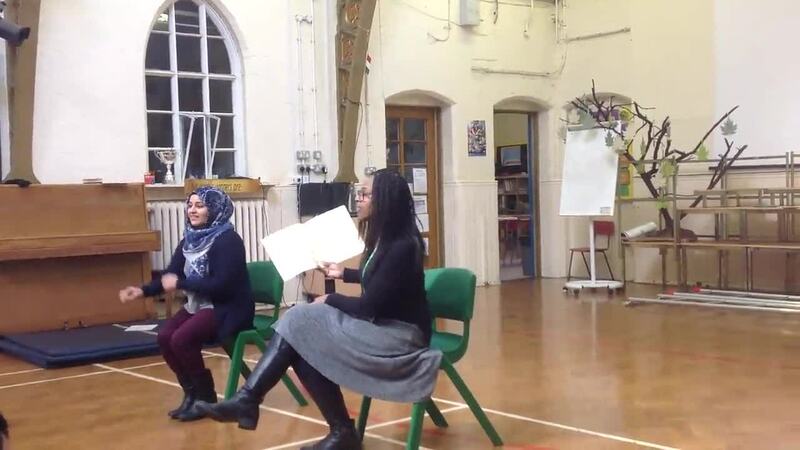 Well done to Wissam, Aisha and Nur on impressing judges and audience alike with your skills and polished performance! 33 children from Year 5 visited The Shakespeare Birthplace Trust in Stratford Upon Avon and took part in a range of hands on activities including making a seal and writing with a quill. The children are training to become ' guides for the day' at this world famous tourist site and observed other guides. They discovered a wealth of information about Shakespeare's life and home. Over the next week they will be learning specific information about, the house where Shakespeare was born and 'New Place' - the site where he bought a house with his wife Ann Hathaway. Next Thursday 9th March, the whole of Year 4,5 & 6 plus parents of the young guides, will travel to Stratford and will be shown around by the guides. This is an exciting project which we are delighted to be a part of and look forward to the children using their new and existing knowledge in such an interesting way.